How Important is Trump's Recognition of Jerusalem? President Donald Trump's announcement to recognise Jerusalem as Israel's capital, and his decision to instruct the US embassy to be moved to Jerusalem, have dominated world headlines in recent weeks. Many have analysed what lies behind his decision, and why he chose to take these steps now. Amidst the speculation about these points, there appear to be no clear answers to these questions. The reaction from around the world has been almost universally critically. Except, of course, Israel's reaction where Prime Minister Netanyahu has lauded Trump's announcement as courageous, just and historic. It is interesting to understand why western countries have been so opposed to this announcement, and why so many countries have responded in criticising Israel when Israel was not party to this action at all. Not to speak of the anger shown by the Arab world with riots being held in many countries. And the launching of missiles towards Israel in a way that one may have viewed Israel to be the offending party here. Why has there been such a huge reaction to this announcement? Previous American presidents, most notably Democratic Presidents Clinton and Obama, are on record stating the Jerusalem is the capital of Israel. The Jerusalem Embassy Act has been on the US statue books since 1995, and dictates that the US embassy should be moved to Jerusalem. In reality, Trump has said and done nothing new. He has simply followed in the footsteps of others before him by reiterating the obvious. The fact that Jerusalem is Israel's capital cannot be disputed. The decision as to which city is the capital city of any country, is one that is taken by the country itself. It is almost unheard of for any country's choice of a capital city not to be recognised or respected by members of the international community. Israel declared Jerusalem to be her capital in 1948, a fact that was entrenched in the Basic Law in Israel in 1980 with the Jerusalem Law. The Knesset sits in Jerusalem as do all government ministries. Both the prime minister and the president have their offices and residences in Jerusalem, and foreign dignitaries are received in Jerusalem as the nation's capital. Trump's announcement, or lack of announcement, makes no difference at all to the situation. The fact that Jerusalem functions as the country's capital cannot be denied even by the most anti-Israeli person. So why the furore over Trump's announcement? It stems back to 1947 when the Arabs refused to accept the UN Partition Plan for Palestine that envisaged the sharing of Palestine, as it was, between Jewish and Arab states. It also envisaged Jerusalem being a city under international control that would be shared between the Jews and the Arabs. When the Arabs rejected this plan and grabbed whatever they could for themselves (including East Jerusalem), one would have thought that the UN plan was effectively rejected and binned. Following a number of wars in the intervening period which saw the Arabs trying to grab more for themselves, but ultimately losing ground, the Arabs ironically still reject this plan as being not enough for them. Perhaps this is because the Arabs continue to plot for the takeover of the entire city of Jerusalem, and the expulsion of the Jews from all parts of it. In spite of all of the history, the international community has continued to pressurise Israel to honour the plan, even though it was formally rejected by the Arabs. In this context, the international community refuses to recognise Jerusalem as Israel's capital, believing instead that the Arabs have some right to it. They continue to demand a piece of Jerusalem for an Arab country, that seems unlikely to arise in the near future. What has suddenly changed since 1947 when the Arabs rejected the plan to share Palestine and Jerusalem? I don't think that anything has changed since then, and I suspect that the same plan would be rejected today by the Arabs as it was then. For those who continue to insist that the Arabs have some rights to Jerusalem, Trump's announcement has been interpreted as reducing the possibility of this becoming reality. They consider that Trump effectively took Jerusalem off the table from any peace talks that may take place. If they were more honest, I believe that they would acknowledge the fact that the Arabs have no current plan or intention to sit down in peace talks anytime soon. In my view, this means that Jerusalem was never really on the table at all. Jerusalem has never been freer, than since the city was unified under Israeli rule in 1967. All religions are free to worship at their holy sites, providing that they come with intention of behaving respectfully and peacefully. While Jews were denied the right to visit the holiest site in Judaism when it was under Arab rule, Muslims have been assured the rights to their holy sites under Israeli rule. The Israeli government has rebuilt the city of Jerusalem, improved its infrastructure and made it more desirable for all those who wish to live in and visit the city. This should surely be something that influences the views of the international community regarding the most appropriate entity to rule over Jerusalem. The argument that many of the citizens of Jerusalem, particularly in East Jerusalem, are Arabs who have no desire to be citizens of Israel is also used as reason why this area of the city should be ruled by a future Palestinian state. It should be known that these residents were offered the right to Israeli citizenship, and have many rights as permanent residents of Jerusalem and Israel in spite of their rejection. Just because entire neighbourhoods of Paris are dominated by Muslim residents, does not mean that these neighbourhoods should form part of an Arab state. Why is this different in Jerusalem? The Trump announcement is not a trailblazer, and changes nothing in reality. It is essentially an insignificant act for Israelis, Arabs and the international community. Israelis may appreciate the statements of support for the Jewish right to Israel and Jerusalem, but are essentially indifferent to Trump's announcement. They care little about what was said, and would have cared the same if it was not said. Israelis are determined that the united city of Jerusalem be the capital of Israel, and nothing has changed. There can be no doubt that the announcement by Trump has been seized upon by those who are determined to destroy Israel. They have taken the opportunity to further their aim of ultimately ridding Jerusalem and Israel of Jews. Trump's announcement is being used to justify this in a manner that is politically correct. It seems entirely acceptable to launch rockets into Israel, to attack Israeli soldiers and to riot in Bangladesh in response to the Trump announcement. The announcement itself was of no consequence, and nothing has changed. Jerusalem will continue to be the capital of Israel whether the world accepts this or not. Perhaps this is what Trump came to realise. The visit to Israel by US President Donald Trump has come and gone, and the analysts will undoubtedly still spend some time considering their verdicts dissecting each aspect of the visit. At first glance, the visit appears to have been filled with symbolism but short on substance. Following a turbulent first few months in office for the US president, there are many who wonder whether his support for Israel is welcome, or whether it is turning out to be more of a poison chalice than a helping hand. Trump has been openly and publicly supportive of Israel's position, even from before he was elected. His high profile campaign promise to move the US embassy from Tel Aviv to Jerusalem has been the subject of much debate and controversy. When his victory in the presidential election was revealed, the Israeli government (and many other Israelis) welcomed his election with the hope and expectation that this would change the anti-Israel bias within the US government and elsewhere that was such a feature of the Obama administration. And changes have certainly been felt since his election. The current atmosphere at the United Nations is entirely different from the one that ruled during 2016 and before. Part of this change can be attributed to new UN Secretary General António Guterres, who is much less inclined to entertain the constant barrage of anti-Israel sentiment that prevailed under Ban Ki Moon. Much of the change is, however, thanks to new US ambassador to the UN Nikki Haley and the change in policy that she represents. She has imposed the Trump administration's support for Israel at the UN in the strongest possible terms. The days of raising frivolous anti-Israel resolutions at the UN Security Council are over for now. The international community has understood that these will be vetoed by the US, and that there is little point in raising them under the current administration. Haley has been vociferous in her condemnation of the constant attempts to paint Israel in a negative light. There can be little doubt that the changes at the UN have a great deal to do with the new man in the White House. President Trump's visit to Israel was highly symbolic. He made Israel one of the stops on his maiden foreign tour since becoming president. 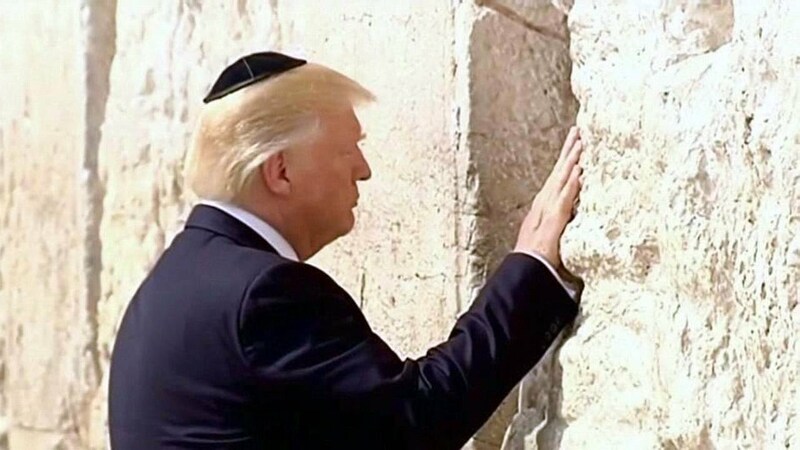 He visited the Western Wall in Jerusalem during his visit, becoming the first US president to make this visit while in office. He emphasized to Palestinian Authority President Mahmoud Abbas that funding terror is not acceptable. He reinforced the support that Israel will always enjoy from his administration. In spite of this, he stayed clear of the key substantive issues confronting Israel and the region now. He did not raise the move of the US embassy to Jerusalem. No mention was made of the constant accusations against Israel regarding construction in Judea and Samaria. Nothing was said about Palestinian claims to Jerusalem, or accusations regarding Israel's claims to Jerusalem as its capital. His outward shows of support were all seized upon, recognised and appreciated by the majority of Israelis. The lack of meaningful progress in getting Israelis and Palestinians to sit down around the peace table is what the international community has seized upon. The issue that Israel needs to consider is Trump's overall standing within the USA and further afield. It was clear before he arrived in Israel that Trump has many enemies at home, and that they are determined to keep him on the back foot by levelling all types of accusations against him. Trump's own conduct in defending these accusations has certainly not helped his cause. And Israel was dragged into the crossfire when Trump was accused of sharing secret intelligence received from Israel with Russia. If true, this would be a serious violation of trust, and norms associated with the sharing of intelligence information. Distrust for Trump appears to be spreading rapidly within the international community as well. Trump's recent appearances at the G7 and NATO meetings did not show him to be in accord with any of the other western leaders. On the contrary, there are indications that Trump is being sidelined from the key international organisations. Winston Churchill famously said, “Diplomacy is the art of telling people to go to hell in such a way that they ask for directions.” This is an art that Trump has clearly not yet mastered. Even though Trump frequently says things that many people are thinking, he has not yet discovered how to say it in a way that does not create enemies. While Israel has no particular issue with Trump's popularity (or lack of it) in the international community, there is a danger that Israel will be tarred with the same negative brush if she is seen to be too closely associated with Trump. There is no doubt that Israel has already gained a great deal from the change of administration in the White House. Trump's influence over US domestic and international policy towards Israel, and his influence over proceedings at the UN cannot be under-estimated. Israel will certainly wish to see more of that in the future. There is a danger, however, that the association with Trump could prove to be negative in Israel's relationships with other countries around the world. If Trump continues to completely ignore the accepted rules of international engagement while representing his contrary views, he will quickly became a pariah in the international community. And, even if Israel wishes to stay close to Trump to benefit from his supportive views and actions, the association with him may proved negative. The prime minister and the Israeli government has a tough job to navigate a careful path to take advantage of the emerging situation, without losing too much in the process. Will Trump prove to be the good things for Israel that were predicted, or a poison chalice? Only time will tell.